Two tendons in each ankle connect your leg muscle to bones in your midfoot and the arch of your foot. Peroneal tendonitis is an injury that can affect one or both of these tendons, causing pain, inflammation and tenderness. Without treatment, peroneal tendonitis can escalate into a more serious condition called tendonosis, which the American College of Foot and Ankle Surgeons says may require surgery to correct. Non-surgical methods such as immobilization and anti-inflammatory medications can be effective ways to begin treating peroneal tendonitis, followed by strengthening exercises as your symptoms diminish. Peroneal tendonitis is most often the result of repetitive movements. 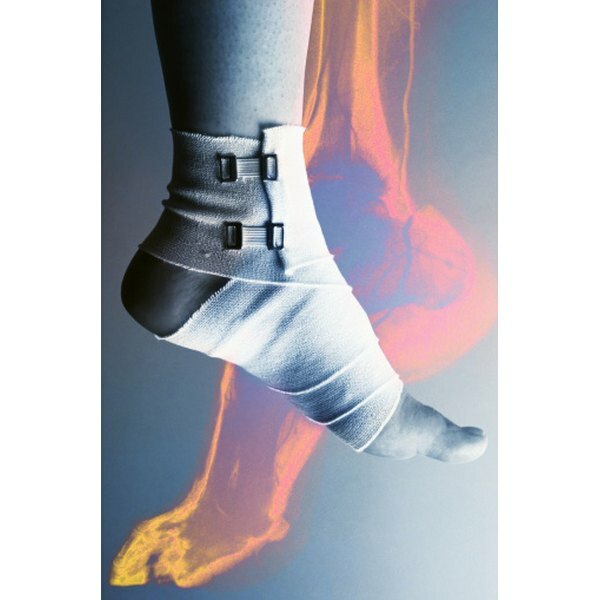 Activities commonly associated with peroneal tendonitis, according to PhysioAdvisor.com, include dancing, basketball, football or volleyball. Continuously walking or running, especially on sloping surfaces or uneven terrain, frequently changing direction or jumping up and down can all eventually cause the pain and inflammation characteristic of tendonitis. Repetitive movements alone cannot cause peroneal tendonitis, however, unless underlying factors are also present. Two underlying factors that PhysioAdvisor.com describes that relate directly to exercise include poor flexibility and muscle weakness. You should not perform any exercise until your doctor or physiotherapist evaluates your condition and gives his permission. In addition, you should stop exercising if symptoms return. Exercising too soon or too strenuously can aggravate your condition and extend the healing period. The University at Buffalo Department of Orthopaedics in Buffalo, New York, suggests beginning exercising only when you can comfortably bear weight on your injured ankle with your heel on the floor. The University at Buffalo Department of Orthopaedics says the function of peroneal exercise is not only to strengthen peroneal muscles and tendons, but also to strengthen your entire ankle joint. Range of motion and balancing exercises will form the core of your strengthening program. Unless your doctor advises otherwise, PhysioAdvisor.com suggests performing strengthening exercises three times each day. Range of motion exercises can include first moving your foot and ankle up and down, stretching as much as you can without feeling pain for 10 to 20 repetitions and then repeating, this time moving your foot and ankle in and out. Another good stretching exercise the UBDO suggests is the towel stretch. To do this, sit on the floor with your injured leg stretched out. Grasp a hand towel with both hands, loop it around the ball of your foot, and while keeping your leg straight, pull the towel toward you. Hold your position for about 30 seconds, then repeat twice. A good balancing exercise is the single leg balance. Try to balance on your injured leg for 30 seconds, first with your eyes open and then with your eyes closed. Toe raises can also help improve balance. Stand up and then rock back on your heels so that your toes are off the ground for about five seconds. Repeat this exercise nine more times and then do two more sets of 10. University at Buffalo Department of Orthopaedics: What is a Peroneal Tendon Strain?